Corporate Ice Cream Van Hire London and the South East. Honours Ice Cream were booked to cater for a blue chip company based on the outskirts of London. This was for corporate ice cream van hire service on the borders of London and the M25. Corporate ice cream van hire Throughout London and the south east! We arrived stocked and ready to serve hundreds of staff courtesy of their Company. The ice cream van was in place , already washed and clean inside and out. I opened the servery window to get some air as I had 15 minutes before service was to commence, all the main preparation was already complete but there were a few last minute things to do. I turned my back as I was arranging some lollies in to place when I noticed a 10 metre queue already appeared and growing by the minute. I soon moved into action and had the stream of customers constantly moving until they were all served and dusted! Every body seemed very happy and complimented us on the large selection of products on our menu. We supplied our full ice cream selection consisting of Wall’s, Treat’s, Nestle, 12 flavoured scoop ice creams, scooped sorbets, selection of various flavoured Knickerbocker glories, fruit lollies, tubs, oyster’s, ice cream boats, screwball’s and not forgetting raspberry and strawberry flavoured slush puppies. The management came to thank us for providing the ice cream service and they have re booked us for another event next month. On the way out the security chap said to me “you were the most popular attraction here today”. I replied, thank you that is nice to hear, but certainly felt like it! 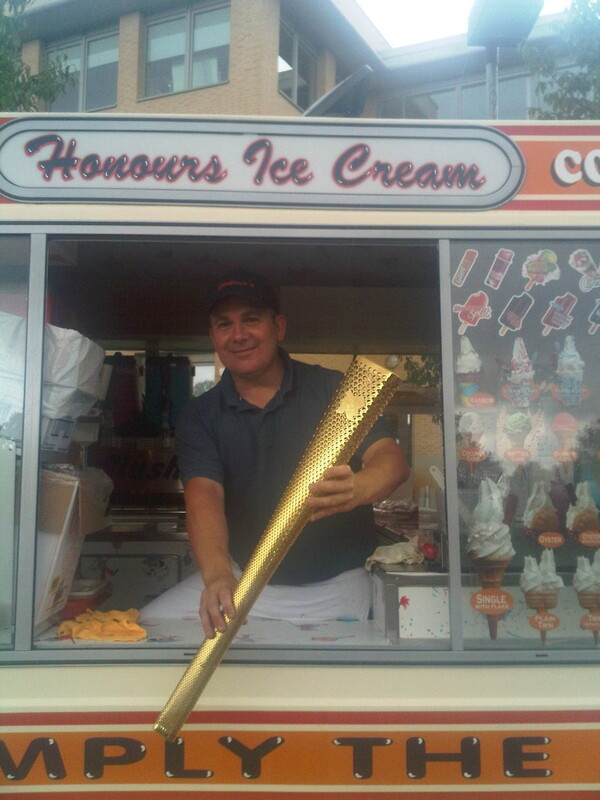 Honours Ice Cream hired to provide an ice cream van for a small corporate event in Kensington, London in June 2012. We were hired to provide the ice cream van and measurements of the top and lower panels. We specified that this was a new ice cream van that we do not normally brand but there was a type of banner made with very little adhesive, it was more like the plastic that you stick on windows and can be taken off very easily. The song “Heatwave” by “Wiley” was blasting from the ice cream van as we gave out free complimentary Mr Whippy ice creams cones and 99’s. The song was very popular with the passing public and confirmed its popularity by making the top of the UK charts late July, August 2012. Above is a photo of a corporate ice cream van hire in London early August 2012. Honours Ice Cream were booked to provide an ice cream van with free ice creams compliments of “The Sun Newspaper”. We served hundreds of soldiers and page three girls who were also present. The most popular ice cream was Twin cone vanilla soft whip 99’s with all the toppings. All were very happy and even jumped in to the ice cream van for a quick photo shoot with the girls at the servery. This entry was posted in Events on July 21, 2012 by Onur.